Although a veteran filmmaker, director Henri-Georges Clouzot (Les diabolique (1955), La vérité (1960)) realized his first commercial breakthrough by capitalizing upon the popularity of the novel by Charles Arnaud, Le Salaire de la peur (The Wages of Fear) (1950). In notable contrast to modern adaptations (read: sheer financial exploitation) of literary franchises, Clouzot did not phone it in. Notwithstanding the dialogue in six different languages, the success of this thematically overcast thriller spread from Clouzot’s native France (as one of the top-grossing films of 1953) to the rest of the world. Although Clouzot never attained the respect of his French New Wage peers, over half a century later, the DVD/Blu Ray release of The Wages of Fear is considered one of the most highly regarded in the Criterion Collection. The story of Sorcerer (1977), which is actually the third film adaptation of Arnaud’s novel, marks the beginning of the end of the studio reign of the American auteurs. Although not boasting nearly as high a budget-to-box office ratio as Michael Cimino’s Heaven’s Gate (1980) or Francis Ford Coppola’s One from the Heart (1982), this unfortunately titled movie had the bad luck of opening four weeks after the second blockbuster blow to the New Hollywood – Star Wars (1977). Well, that’s the legend, anyway. (As trucker epics go, Smokey and the Bandit, released just two days after Star Wars, was the fourth-highest grossing film in the U.S. in 1977, and Sam Peckinpah’s Convoy (1978) almost quadrupled its budget at the box office.) As a result, a proper post-mortem vetting of this big-budget cult film/underrated masterpiece has been undermined by a deficient video transfer and decades of legal limbo. Director William Friedkin (The French Connection (1971), The Exorcist (1973)) has finally wrestled the rights away from Paramount Pictures and Universal Studios and completed a digital restoration, which has only recently showed in select theaters in anticipation of a Blu Ray release on April 22, 2014. Although Friedkin has resisted the characterization of this (his personal favorite) as a “remake,” the fact is that he sought Clouzot’s blessing prior to production, and there are simply too many visual echoes of the original film (a child wondering through the street naked from the waste-down, a goat departing from a passenger plane, etc.) to deny its influence. Stripped of the thick sociopolitical subtext, both The Wages of Fear and Sorcerer are essentially prison-break movies. Both films open with four men exiled by their pasts, barely existing in a South/Central American town located just south of purgatory. When an oil well blows out, killing many of the local workers, a high risk/reward proposition presents itself: the exploitative U.S. company is willing to throw a bunch of cash to the four best drivers who are able to successfully transport highly volatile nitroglycerin several hundred miles away through all sorts of unfriendly terrain. Suspense ensues. As a preemptive response to those who tend to complain about all that is “relative” in “classic” films (social mores, production values, technology, etc. ), it is worth noting while the theatrical releases of these films were separated by 24 years, it has been almost 36 years since the release of the latter. So under the circumstances, the following question is a fair one: to the viewer in 2014, which is the more effective film? 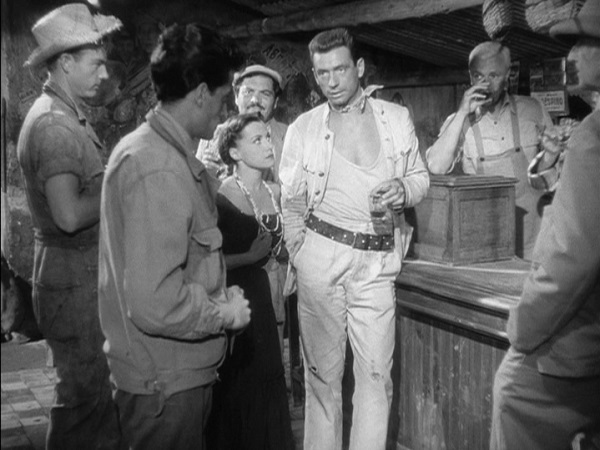 As distinctive as it may have been for its time, The Wages of Fear still feels very much like a popular French film from the 1950s – the disdain for the United States (which resulted in substantial cuts to the version that appeared on this side of the Atlantic), the flair for the existential (most evident from the final sequence, complete with a musical cue that would make Stanley Kubrick proud), and of course, an eye for the ladies. And that brings us to the first distinction between the two films. To effectively sell this dark tale, the filmmakers have to put us in a place of desperation, and nowhere is the milieu of a third-world hell more personified than in the character of the barmaid – a character who did not appear in the original novel. Linda is a friend-with-benefits of the owner of the hand – Mario (Yves Montand), one of the main characters – who later describes her as a “beast” to more civilized company. Indeed, times are tough for Mario. 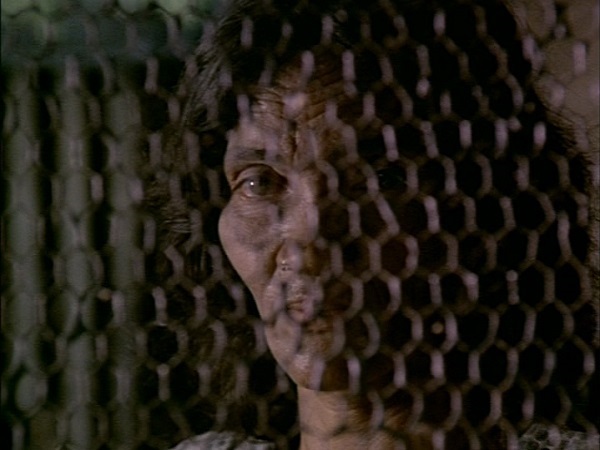 In stark contrast, consider the first shot of the unnamed barmaid in Sorcerer. When all is said and done, that image is really all you need to know about a life lived in Friedkin’s village of the damned. If the very essence of existence in Clouzot’s world is mucky and sweaty, Friedkin’s is mucky, sweaty, and bloody. The setup for the four main characters also differs significantly between the two films. Director Quentin Tarantino is known for extolling the virtues of the “hangout movie” (Rio Bravo (1959), Dazed and Confused (1993)) – namely, the sheer enjoyment in just hanging out with some well-written, well-acted characters (whether likable or not). And therein lies one of the intangible charms of The Wages of Fear, the first 45 minutes of which consists of hanging out with the rogues gallery of characters. In many cases, we are not exactly sure what each character has done to end up at this end of the world; we only suspect that some of them may represent various species of bottom-feeders. Unfortunately, in handling these characterizations, both narratively and visually, Clouzot ends up undermining the audience’s anticipation for the last 100 minutes of the film. In a shot like this, which one of these characters do you think is in the least danger? More importantly, which one would you most want to outlive the others? On the other hand, true to the prison-break genre, Friedkin takes a more direct plot-driven approach with a four-part prologue separately introducing each character – a hitman (Francisco Rabal) assassinates in cold blood; a terrorist bomber (Amidou) escapes authorities in Jerusalem; a white-collar criminal (Bruno Cremer), having driven his in-law’s business into the ground, literally fleas his family in Paris; and a low-level gangster (Roy Scheider) calls in his last favor after a botched robbery sparks the ire of a competing mob. Although Scheider was likely to draw the most attention just two years after his starring role in Jaws (1975), both Friedkin and screenwriter Walon Green (The Wild Bunch (1969)) take a democratic enough approach to keep the viewer guessing as to whether any of these bastards would or should survive their fateful journey. Whatever other aspiration the filmmakers may or may not have had, The Wages of Fear and Sorcerer are, first and foremost, genre films, and the shared (and outlandish) premise of each makes a big promise to its audience in terms of expectations. Both films benefit from location shooting. And Clouzot was unquestionably ambitious for his time. But as a convincing action film, Sorcerer better stands the test of time. Friedkin’s seminal work has always been a mixed bag – at times, the framing and the still images feel very much like the product of a conscientious eye; at other times, the shaky camera seems to intimate nothing more than simple corner-cutting. That said, Sorcerer’s then ridiculous budget is never squandered. One particular sequence (the crossing of the bridge) might just be one of greatest exercises in tension ever put to celluloid – not just in terms of visual effects, but in sound design. In this age of weightless CGI, it is a tragedy that so few genre film aficionados have seen Sorcerer in all of its intended grimy gory glory. I’m a bit shocked by the fact that you rate Wages of Fear lower. I thought that movie was a lot better. It spends more time in the town, letting you get to know the characters and the ride felt much more thrilling. Also that ending in Wages is extremely memorable. Which one did you see first? Thinking this might also influence which you like more (for me it was Wages). Little late on this thread but I agree with you. Would you really expect a bar maid in that hellhole to look like a brunette Bridget Bardot? And all that time in Wages “getting to know” the characters, we learn nothing about them except no one likes the Americans or capitalism. The ending, in trying to be poignant, ironic, or some form of French existential whatever was so predictable that it was funny. And lets not forget the great score by Tangerine Dream in Sorcerer. Wages is a fine film but people seem to give it better reviews because it is French, is slow in parts (makes it a deeper film it is alleged), and has more social commentary (anti capitalist/American). Just completed my own back-to-back viewing, my second of each, before reading your fine and enlightened comments. Understanding your grading parsimony, I’d still give both films higher credit if for no other reason than the singularity both represent. In each movie, moments exist that were never accomplished in film before and have yet to be duplicated since. 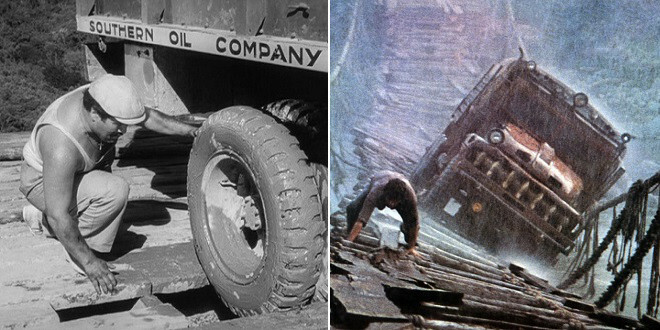 Specifically, the oil pit scene in Wages and the famous and much acclaimed (for a now obscure film) wooden bridge scene in Sorcerer. In each, suspense and tension hold the viewer like in no other work, even Hitchcock. Your article reads as if truncated, as though you needed to delete sections to meet a word limit. Do you have other thoughts that didn’t make it into the piece? If so, I’d love to hear them. Thank you for your kind reply … To answer your question, with four years passing since my last viewing, the answer is probably no. However, I try to never miss an opportunity to respond to an inquiry with another inquiry: given that you appreciated both films a bit more than me, is there one that plays better the other? The only reason I ask is that it falls into a more general interest of mine when it comes to assessing popular film (1) are “great” movies really “timeless” and (2) do they need to be?